New York City, like most large cities, is a heat island. With miles of paved surfaces, it is generally warmer than surrounding rural areas. Within city limits, public display thermometers – on banks and gas stations – demonstrate this phenomenon on a micro scale. They are often positioned in the sun and over a concrete or asphalt surface that absorbs heat. As a result, they can read 5°F to 10°F higher than the city’s official air temperature taken in the more bucolic conditions of Central Park. 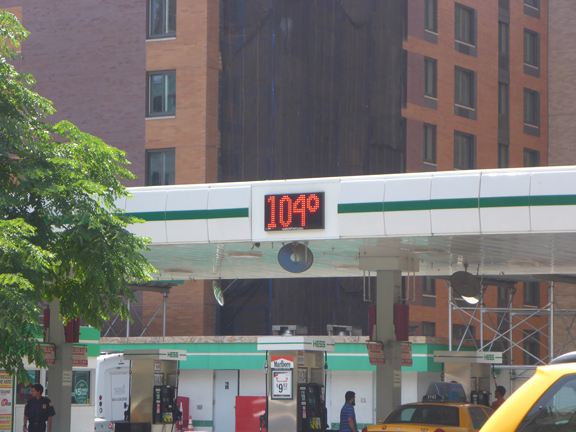 The thermometer on this NYC gas station reads 104°F, but the official high temeprature for the day was 92°F. This entry was posted in weather and tagged heat, nyc, summer, temperature by Melissa Fleming. Bookmark the permalink.